Birds have always fascinated me. Watching them go about their everyday lives provides a nice escape from the daily stresses of my own. They’re beautiful, graceful, and many times, comical to watch. And isn’t it amazing to think that something with a “bird brain” can be as intelligent as they often prove to be? As interested as I am in birds, however, until recently, I never had a bird feeder at my own home. None of the places I have lived have offered a good watching spot for me and I’ve just let the neighbors care for the birds. All that changed when I received a bird feeder for Christmas. After letting it become a fixture inside the house for a few months, I finally decided that even though I still did not have a good spot to view the birds from, I would at least help them survive this cold weather. So out into the cold I went to hang the feeder and do my best to show a little kindness to our feathered friends. Imagine my chagrin when, after several weeks of sitting filled and ready, there still seemed to be no visitors to my adorable new feeder. That was when I decided to do some investigation into how to draw birds to a new feeding site and I found that I may have made some mistakes when hanging my feeder. Add a nearby birdbath to help birds notice and visit a new feeder, but do not position the bath so close that it will become dirty and clogged with seed debris. A bath with moving water, such as a birdbath fountain, wiggler, or dripper, will be most effective at catching birds’ attention. Fill a new feeder with the most popular type of bird seed you can find. Black oil sunflower seeds, sunflower hearts, and Nyjer seed are the most popular and mixes that use seeds birds want and not tasteless filler will not only attract birds faster, but also make less waste. Last, but not least, be patient! It takes time for birds to become accustomed to a new feeder and to visit it regularly. Make the feed and feeder as attractive to the birds as possible and then put up your feet and wait. 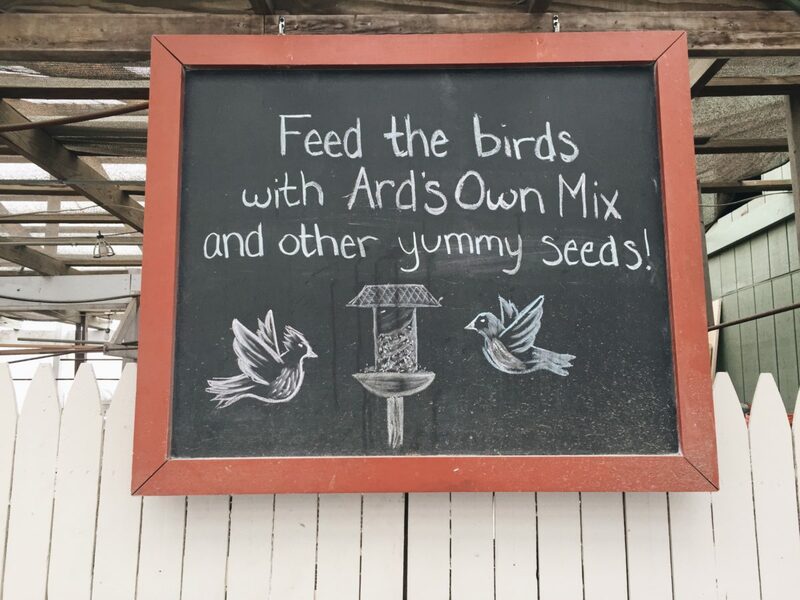 I’m going to rethink my feeder location and make sure it is filled with quality seeds like the mixes I get from Ard’s Farm. I’m sure with the right mix and a little patience, I’ll be enjoying their antics in no time!